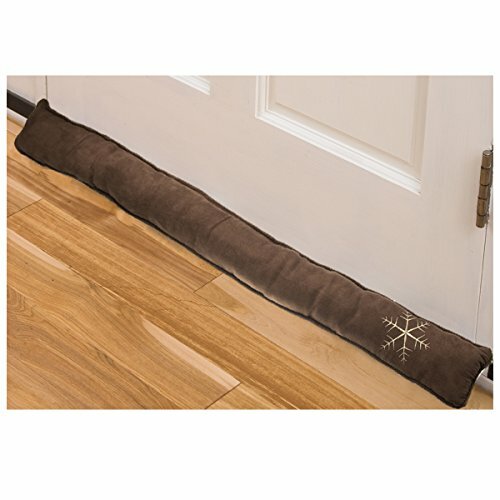 Simply Genius Door Draft Stopper 36” Interior Air Under Window Air Conditioning Seal Garage Fireplace Guard Blocker, Energy Saver, Soundproof Room by Simply Genius at Home Decor Outlet Store. MPN: DG-1191. Hurry! Limited time offer. Offer valid only while supplies last. Put a Simply Genius Draft Blocker at your front and back doors, and it will keep out drafty cold that can raise heating bills to chilling levels. Put a Simply Genius Draft Blocker at your front and back doors, and it will keep out drafty cold that can raise heating bills to chilling levels. These soft fabric guards are weighted in the right spots to stay in place, and the corded loop can be hung over the doorknob when not in use. Attractive & economical; Filled & weighted fabric blocks drafty, chilly air; Keeps heat or air conditioning in building; For single front or back door, patio, screen door; Save energy/money, locking heat & keeping cold air out during the cold months; Keeps air conditioning from escaping your room during the warmer seasons; Great looking and cost effective for reducing the heating & cooling bill!